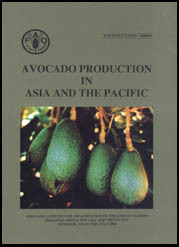 This publication brings together edited manuscripts of papers presented at the Expert Consultation on Avocado Production Development in Asia and the Pacific, held in Bangkok, Thailand, 27-29 April, 1999. The Consultation was organized and sponsored by the FAO Regional Office for Asia and the Pacific. The Report of the Consultation was brought out in June 1999 (FAO/RAP Publication: 1999/19). Reproduction and dissemination of material in this information product for educational or other non-commercial purposes are authorized without any prior written permission from the copyright holders provided the source is fully acknowledged. All rights reserved. Reproduction of material in this information product for resale or other commercial purposes is prohibited without written permission of the copyright holders. Applications for such permission should be addressed to Food and Agriculture Organization of the United Nations, Regional Office for Asia and the Pacific, Maliwan Mansion, 39 Phra Atit Road, Bangkok 10200, Thailand.